On a brilliant Saturday morning in late September, Jeremy Ogusky is a hard guy to track down. Partly, it’s the crowd, larger than usual for a typical Saturday at the Egleston Farmers Market. On this particular day, the Boston Fermentation Festival is sharing the Jamaica Plain market space, adding some tangier offerings to the market’s typical slate of vendors hawking apples and carrots: pickles, kimchi, kombucha, cider, and other fermented foodstuffs. Ogusky bounces from exhibitor to exhibitor, making sure everyone is happy, checks in with the volunteers at the registration table to get an update on attendance (by day’s end, it would exceed 1,400), and peeks his dreadlocked head into the gut health lecture happening inside the adjacent church hall. When he emerges, a volunteer stops him and tells him a local news camera crew wants to pull him aside for an interview. The 38-year-old potter from Jamaica Plain is the unlikely engine behind a growing community of local home cooks and chefs who are fermenting their own foods. He co-founded Boston Ferments, a “collective of fermenting enthusiasts,” in January 2014, and has spearheaded two successful fermenting festivals and a handful of other microbial events. Recently, Ogusky was asked to be part of an organizing committee thinking about promoting the practice of fermentation nationwide. He hasn’t been at this long—lessthan five years—but Ogusky has found a way to meld his newfound passion for fermenting with his professional craft, designing small batches of clay crocks he says are flat-out the best method for fermenting foods. Local author and fermentation expert Alex Lewin, who wrote Real Food Fermentation, agrees, calling the crocks “beautiful and functional,” and lauding Ogusky for his role in advancing food fermentation locally. “He’s inoculated Boston with fermentation energy,” Lewin says. Before humans were salting, drying, pasteurizing, or freezing food to preserve it, we were fermenting. The science of it is pretty simple: by storing foods in a controlled environment, we can encourage the growth of positive bacteria that eat the spoilage-causing microorganisms in the food. This reaction, which can take anywhere from a week to several months, is what makes pickles taste “pickly” and gives beer the alcoholic bite. Indeed, we discovered early on that bacterial microbes not only preserve many foods by making them acidic, it can give foods a flavor profile that it did not have when it was fresh. We think first of krauts and pickles as quintessential fermented foods, but so are chocolate, cheese, coffee, yogurt, and many cured meats. Fermentation is not new, but like so many older culinary practices, it is part of an international movement that critiques the industrial food system of the last half-century and encourages a return to slower, less processed ways of eating. “Once people start interrogating their food, where their food came from and how it was produced, fermentation just becomes a critical piece of the story,” says Sandor Katz, a fermenting mentor of Ogusky’s who authored the 2012 New York Times Bestseller The Art of Fermentation and was keynote speaker for the 2014 Boston Fermentation Festival. 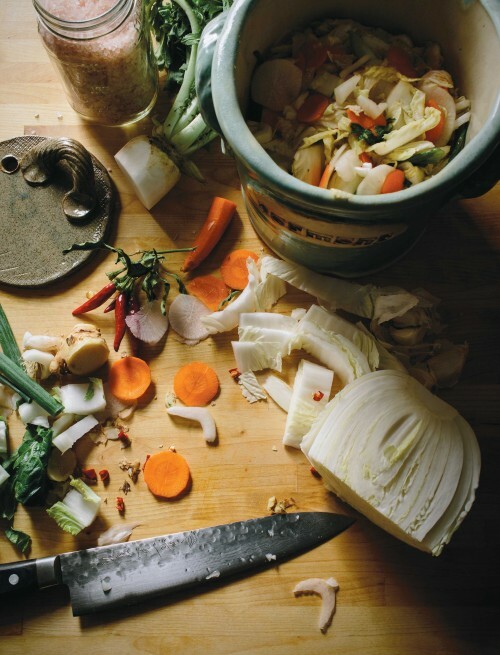 That contemporary books on fermentation could reach the literary pinnacle—Michael Pollan even dedicated a chapter to fermentation in his latest book, Cooked—speaks to the widespread interest in the topic. But why now? Ogusky chocks it up to a perfect storm of interest from real food enthusiasts, health food nuts, and the “urban homesteader” crowd. Fermented foods, Ogusky says, offer “a taste you can’t really achieve any other way” and flavor profiles that reflect the food’s terroir. Chefs are flocking to fermentation in droves, making their own fish sauces and putting homemade krauts and kimchees on their menus, but also delving into cheesemaking and charcuterie. Do-it-yourself adherents have gotten behind fermenting en masse, fueled by the desire to save money, but also as a way to stick it to Big Agriculture and the industrial food system. Ogusky’s interest in fermentation goes back to his grandmother’s borscht. His ancestors hailed from Eastern Europe. He fell in love with his grandmother’s fermented beet recipe at an early age, an experience that gave him both a taste and nostalgia for the style of food preparation. It is, perhaps, this connection with an historic practice that has driven Ogusky’s passion for both fermenting and pottery today. Ogusky lost a job at Harvard several years ago and was encouraged by his wife to pursue pottery full time. Four years ago, Ogusky tried his hand at making sauerkraut, and he was hooked on the do-it-yourself aspect of the craft. Soon, he had designed a clay crock specially purposed for fermenting foods, which he sells to consumers and chefs nationwide. It is Ogusky’s most popular item, and Williams Sonoma even started selling them. Through the education and outreach he was doing with his crocks, Ogusky increasingly was being asked to speak at events and festivals about fermentation. It was at the Let’s Talk About Food Festival a few years ago where he met Geoff Lukas, the head chef at Sofra Bakery in Cambridge, with whom he gave a talk about fermenting foods. Lukas, who draws heavily on Middle Eastern practices, including fermentation, in his cooking, had been experimenting heavily with the methods. Meeting Ogusky, however, introduced Lukas to a kindred spirit whose crocks have inspired a number of new ferments. When Ogusky wanted to experiment with making an unglazed, porous fermenting crock, he called Lukas and asked if he’d be interested in using it to ferment a garum—which is a fermented fish sauce rooted in ancient Greece. “He’s been kind of a driving force in what I’ve done,” Lukas says. Ogusky believes most of the knowledge he and others are sharing should be free, or open-sourced. His commitment to the gift economy, Lewin says, makes Ogusky the perfect local ambassador for fermenting, which is, by nature, a process that is open and symbiotic. “They’re not your microbes, not my microbes—they’re everyone’s,” he says. This story appeared in the Fall 2014 issue.